Can you survive without snacks? Answer: No. A snack is a small portion of food that can be eaten between meals. We eat snacks when we are bored, stressed out, too tired to cook, or when we can’t just get food. So you see, you can’t survive without snacks. Nigerians love snacks and have a lot of them. These snacks are not just handy, they are also delicious. Since we are very creative people, there are many snacks from different regions if Nigeria. Well today you will see the top ten Nigerian snacks, and because my main goal is to keep you healthy, I added their health benefits. This list was based on their popularity and partly on their tastiness. As you read focus on the health benefits. Please note that am not a food expert. But I assure you that you will not just learn something new today, you’ll also laugh hard. So please let’s look at the top Nigerian snacks and their health benefits. At number ten we have buns. 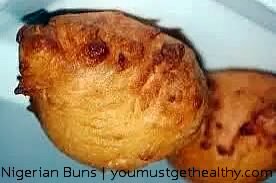 Buns is a tasty deep fried snack. It is prepared with flour and baking powder. The interesting thing about buns, is that you can enjoy it with any consumable drink (except for alcohol and blood lol). Buns contains a lot of calories which is somewhat bad. But the health benefits of eating buns are that gives a lot of energy. The flour also contains many vitamins that benefit the heart. 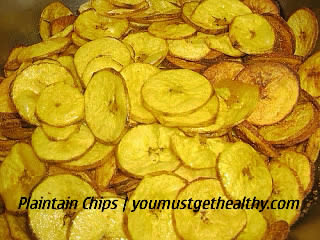 Plantain chips are fried unripened plantain. They are so delicious and can be eaten anywhere.Plantain chips are very abundant in carbohydrates, which means they fuel the brain, muscles and tissues. Also plantains are a rich source of Vitamin A and C. Which means they are very good for your immune system. Egg roll is one if the most popular snack in Nigeria. It is a deep fried snack made with boiled eggs inside. It is the ideal snack that goes well with water or any soft drink (except for wine). Just like buns egg roll also contains a lot if carbohydrates and fats. But the presence of boiled egg makes is healthy, as it is very high in proteins. Meat pie is an exquisitely delicious snack made with chicken, meat, flour and potatoes. It is a very popular snack among the females in Nigeria. Meat pie works well with ice cream. 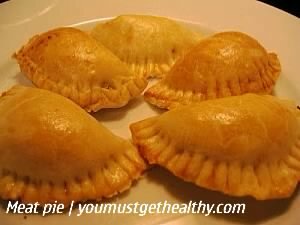 When you eat meat pie, you get healthy significantly, because it contains a lot of dietary fibers that prevents constipation and reduces cholesterol. Okpa di oku o!!! That amazing sentence gives joy and probably ‘hope’ to the people in the eastern part of Nigeria. Its means “okpa is hot”. Because it is best eaten hot . The Common name of okpa is Bambara nut fruit. This sumptuous snack, when eaten, fills your belly full. What are the health benefits of okpa? Okpa is very rich in proteins, which makes good for growth and development. It is also believed to reduce the growth of infectious diarrhea and promote urinary tract health. So when eating okpa you can be sure to get this health benefits. You need to have strong teeth to eat chin chin. 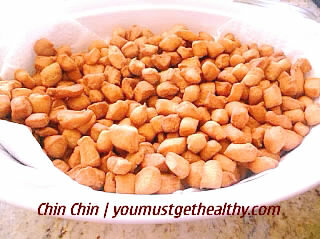 Chin Chin is commonly known as dough rocks. It is a fried crispy snack that has a crunchy taste. Chin Chin is the ultimate Nigerian dessert. Chin Chin is said to have excellent health benefits to the heart. Moin Moin or Moi Moi is also known as bean pie or steamed bean puddles. This is one of the healthy snacks in Nigeria. This snack is so good they named it twice. It is made from beans and assorted spices. Moin Moin can serve as a side dish with Nigerian jollof rice. It can also serve as an appetizer. the ballon d’or of Nigerian snacks. Suya is the most loved snack in all of Nigeria. If you want to woo a Nigerian lady, give her suya. Suya is basically skewered meat or beef made with various types of spices and herbs. It is very spicy and wickedly delicious. What are the health benefits of suya? Due to the conditions it is prepared and the way it is packaged, suya is not so healthy to be eaten just anyhow. But if you want to benefit well and enjoy your suya, eat with cabbage, onions and tomato. It’s healthier that way. Suya can also help you win her heart. Just kidding. At number two is akara. Akara is very popular among Nigerians. It’s so tasty and wonderful. Am sure God gave the recipe to oduduwa to give us Nigerians. Akara is made with beans and deeply fried in oil. It is the best snack that can be eaten with bread or pap. What are the health benefits of Akara? Well to benefit from eating akara somehow depends on the oil used in frying it. It should be cholesterol free. However it is rich in dietary fiber, protein and is perfect for weight loss. Now it’s time to find out the number one healthy snack in Nigeria. Gala is simply sausage roll. But every Nigerian calls it gala. Gala is the most popular, most sold, most eaten snack in Nigeria. It is snack that you eat when you are stuck in traffic, when you are waiting and when someone buys you a free drink. It is practically unforgivable to ban gala in Nigeria. So What are the health benefits of sausage roll, sorry, gala? It is an easily absorbed source if protein, iron and Vitamin B. It is also good for the reproductive and immune system. Hope you enjoyed reading about the healthy snacks in Nigeria. READ How Do Low Carb Diets Work? YOU SHOULD ALSO READ: Top 5 Nigerian soups and their health benefits. I hope you enjoyed reading. Please comment and remember to share this with your friends. lol, I am being both sarcastic and dense.